She was probably hoping at least one, possible two, might respond. But when a Chinese student posted a message at college saying she wanted a boyfriend, they came in their droves. 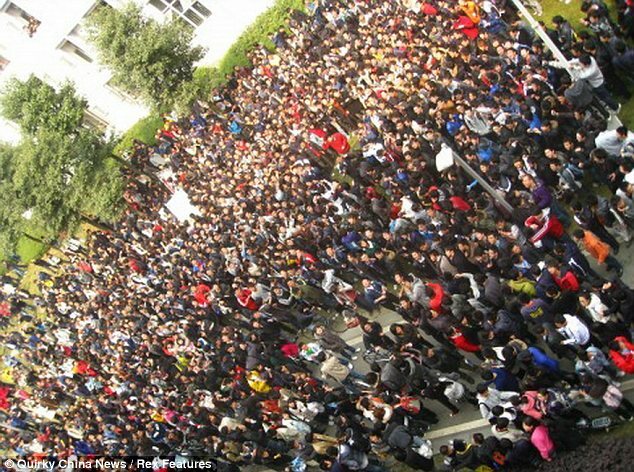 Instead of looking down from her balcony on a romantic scene as her potential suitor waited below, Zhang Mengqian was confronted with a huge mob. Thousands of bachelors descended on the campus of University of Electronic Science and Technology in Chengdu, Sichuan Province, after she put her plea on a message board. The gathering came after the university, which has a ration of 25 male students to every female, declared a 'girls' day'. Each female student was handed a blank card and told to write their wish on it. All the cards were then posted on a 'wish wall'. Zhang wrote: 'My name is Zhang Mengqian, a grade one student, and I think I am attractive, but strangely I can't find a boyfriend. However I believe in destiny. Word soon spread and by noon of March 11, swarms of male students were outside the dormitory building. But only a few completed the second part of the task - to shout out her name. She is pretty but why she is so desperate until she needs to put up an advert? What a cute little girl! Who doesn't wish to be her boyfriend? Well, the fact is that, she could have put up that ad as a joke, or as a litmus test of her potential. Or she could have been yearning for popularity. In one way, she might already have her wish come true at least - she's now an instant star!